I wandered around Fort Bragg yesterday afternoon to see what I could see. A lot more structure has been added to the new Aquatic Center. 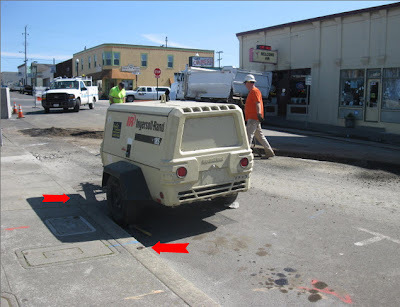 I see they are finally addressing the remaining, difficult, storm drain / sidewalk corner ADA issues. And remodeling the east/west streets of downtown Fort Bragg is ramping up. This is more of the Franklin Street Re-do, only different! The two horse and buggy tie-down rings are still in place. One of the workmen told me the curb and sidewalk will be jack-hammered apart in about two weeks. The spring bloom is well underway around town. Ahhh! Someone's happy to be home. PS you had a wonderful word of the day in the captcha window: outzings! I love your opening shot with the lines and colors! Have you seen any whales breathing? I love the asters and ice plant in bloom. Both are spectacular this time of year and I wish I had either one. I do have jasmine vine which has been blooming since January, so I'm not exactly deprived. Welcome home, at least for the time being!